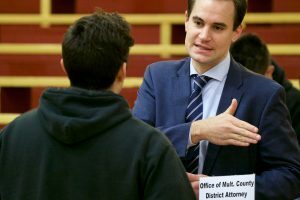 On November 30, 2018, Multnomah County Deputy District Attorney Brendan Stabeno met with high school seniors as part of the yearly Democracy in Action event hosted by Central Catholic High School. “One thing I really like about it is that these students come in with topics and ideas and they are able to ask difficult questions of us,” Stabeno said. This was Stabeno’s second year participating in the event. Democracy in Action aims to provide a meaningful opportunity for students to engage with elected officials, representatives of political parties, campaign organizations, and other government groups to meet with future voters. “A lot of the [conversations] are about current topics, so the #MeToo movement has come up for the last two years,” Stabeno said. As a deputy district attorney assigned to the Domestic Violence Unit, Stabeno said some students wanted to know how the #MeToo movement has impacted prosecutors and whether or not the District Attorney’s Office has seen more survivors of sexual assault come forward. Other students wanted to know about Ballot Measure 11, Oregon’s mandatory minimum sentencing law, juvenile justice reform and laws surrounding immigration and sanctuary cities. Stabeno was able to tell the students about the focused efforts of Multnomah County District Attorney Rod Underhill on youth justice issues, particularly Tier 2 Measure 11 cases. These include serious felony crimes of assault in the second degree, kidnap in the second degree and robbery in the second degree. 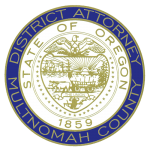 The Measure 11 sentence for these crimes is custody to the Oregon Youth Authority (OYA) facility and an adult felony conviction. However, District Attorney Underhill implemented the Juvenile Justice Reinvestment (JJRP) program that allows certain youth to avoid both a custody sentence and adult felony conviction. This option often allows the youth to enter a plea in Juvenile Court, not adult court, and to receive a probation sentence. This is done in consultation with the court and the involved victim. Youth in this program benefit tremendously from this vastly different program of rehabilitation and appropriate accountability to the victim. The results show that the JJRP program has substantially increased the percentage of youth sentenced to probation and substantially decreased the percentage sentenced to OYA custody. In fact, as of September 2018, 82% of all juveniles eligible for the JJRP have received a probation sentence instead of being sent to OYA. Democracy in Action is organized by Central Catholic High School’s U.S. Government Constitution Team and the Advance Placement U.S. Government classes. 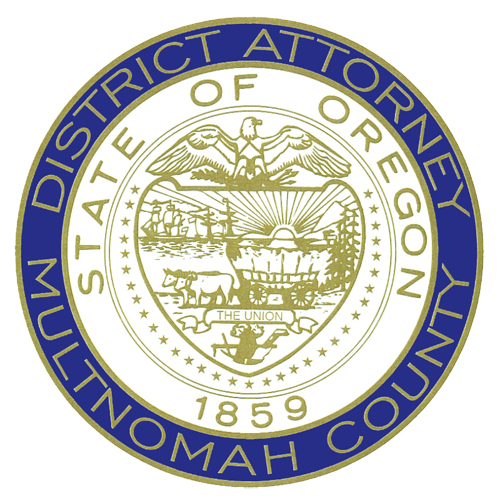 The Multnomah County District Attorney’s Office provides speakers to schools, civic groups, colleges and universities, and other groups interested in learning about prosecution and related issues. “One of things I really like is getting out there and see how our office actually affects people in the community,” Stabeno said. For more information about requesting a speaker for your school or organization, click here to send an email to the District Attorney’s Office. Please ensure to give us plenty of advance notice so we can identify the best representative for your needs.